We Gadgeteers love our flashlights, don’t we? Small and large, piercing the darkness like a searchlight or dimly preserving our tactical night vision, we love them all. 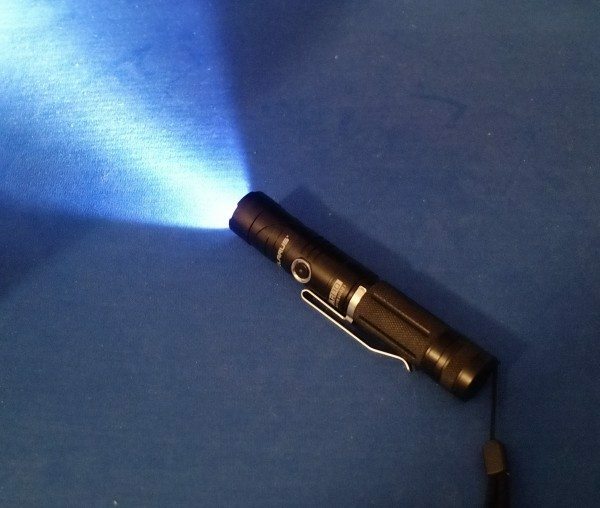 I was recently sent my first Klarus unit to test, the AR10 rechargeable flashlight. It’s a pretty straightforward torch, at first glance, but there are hidden superpowers within. 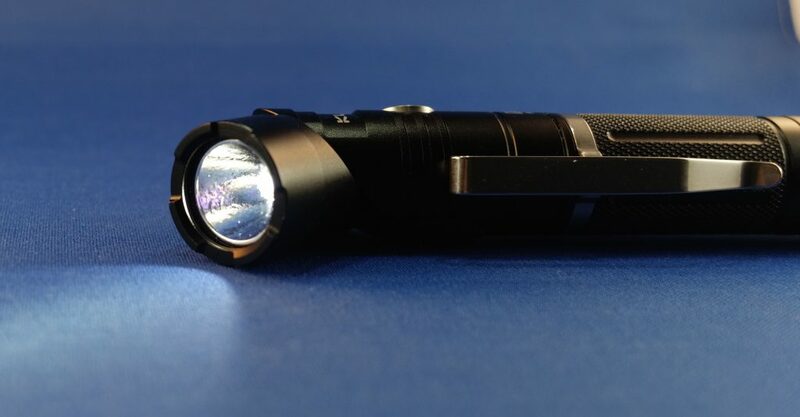 The AR10 is a single-LED, single-focus flashlight, powered by a single 2600mAh Lithum 18650 cell. Illumination comes from a CREE XM-L2 U2 LED. The light meets IPX8 spec, which means it is waterproof to 2 meters, as well as being impact resistant from 1 meter. The battery is easily changeable and reverse-protected (You can’t put it in wrong! ), accessed through a screw-on end cap, sealed with a single O-ring below the threads. There is a single push-button switch that activates both the on/off function as well as the four levels of light the LED can emit (Turbo, High, Medium, and Low). These are 1080, 450, 150, and 10 lumens, respectively. (Low is shown in photo above, High is shown below.) When it’s first turned on, the LED shines at the intensity of the previous use. If a different intensity is desired, the user only has to click a few more times and the unit cycles through them all. Turning the device off is as simple as holding down the switch for a few seconds. Two more modes are available as well. When the light is on in any mode, a triple press will activate strobe mode at Turbo intensity. Another triple press moves it to SOS mode, which is at Medium intensity. There is also a locking feature, which prevents the unit from accidentally being activated by children or from within a pack or suitcase. When the light is first turned on, an indicator glows slightly in the center of the switch. This is the battery power meter. (Center button LED power indicator is above.) It will glow green for 70-100% charge, orange for 30-70%, and red for less than 30%. If it gets down to 10% or less, it will flash red. The unit itself is about 5.5″ long and just under an inch in diameter. The flat end cap is magnetized, so that it will stay attached in an upright or vertical position, or hang from a metal shelf or rack. This is where the AR10’s hidden superpower comes in – you can rotate the head as much as 90°! (All the IT people reading just went weak in the knees, AmIRight?) There is a 45° joint that allows about the top inch to swivel down into a right angle to the main body. The light can stay on throughout the action, and will stay at whatever angle you place it at. With the magnetic tail piece, you can direct a steady beam of light in virtually any direction. Below the end cap joint is a nicely knurled section about 1.5″ from the joint. At that point, there is a groove around the entire torch with a chromed metal clip attached, which can spin around fully. The clip is very tight, and may be removable. I didn’t try – feels like it would bend first. The next three inches moving up to the inset tempered glass lens is mostly smooth, with a few deep designs machined in. Opposite the rubberized push button switch is a gasket-covered port for a microUSB charging cable. Once I charged it up after arrival, I’ve had no reason to recharge it yet. The light is still bright and full, despite frequent test usage. I’m in the orange range. The torch can be recharged without removing the battery. 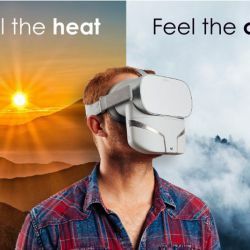 A weather-protected miniUSB port opposite the power button allows you to connect to any powered USB port to grab power and refresh the battery. At 149 grams with a battery installed (5.25 ounces) it’s not going to weigh anyone’s pack or belt too much. 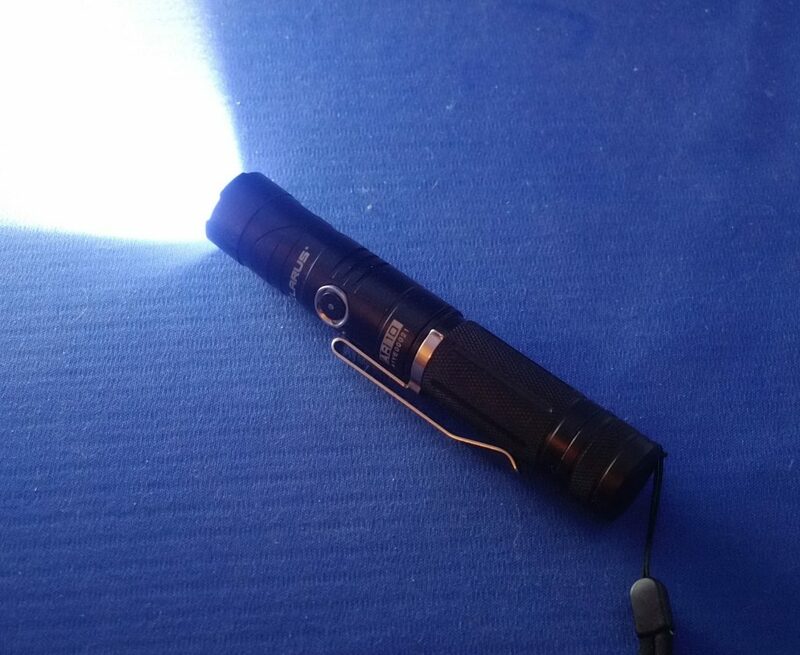 The whole flashlight has a nice heft to it, and I never worried that I would hurt it by dropping it. The AR10 is rated at a high output of 1080 lumens, with a rated runtime of “as long as” 220 hours on a full charge. While Lithium 18650 cells are not everywhere or particularly cheap, they are dependable and long-lasting and can take repeat charges for years. Since they can recharge in place, you may never find you need to replace it, but it’s nice to know it’s pretty standard if you do. Source: The sample for this review was provided by Flashlightz. Please visit their site for more info. Swivel and flat magnetic bottom cap makes unit infinitely adjustable. Really bright at Turbo level. No easy to change to lower intensities without cycling through all levels. 1080 lumens just at 69 is very cheap. But main problem is that i don’t believe much on Klarus Light. I used 2 flashlight and very disappointment performance if i compare with other popular brand! Can the rechargeable batteries be replaced, and are they easy to change? Yes, they can. 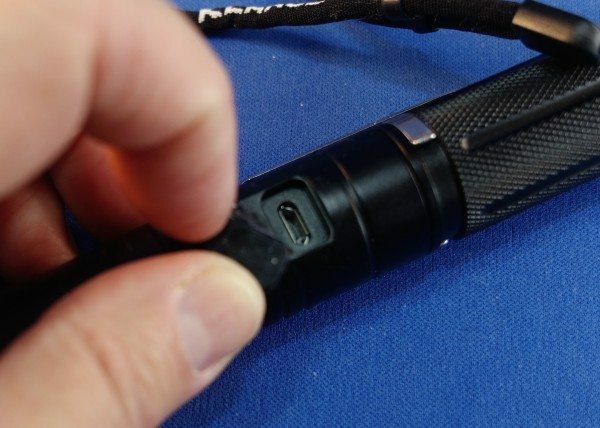 As stated in the review, they can easily be changed, just like flashlights you’ve used all your life. i have a question. does the rotatable head grind or get stuck, or have any problems if the torch is dropped in dirt or anything? does sand or dirt get into the turning machanism and make it harder? thanks for any helpful replies. This is a cool looking light and a neat idea. 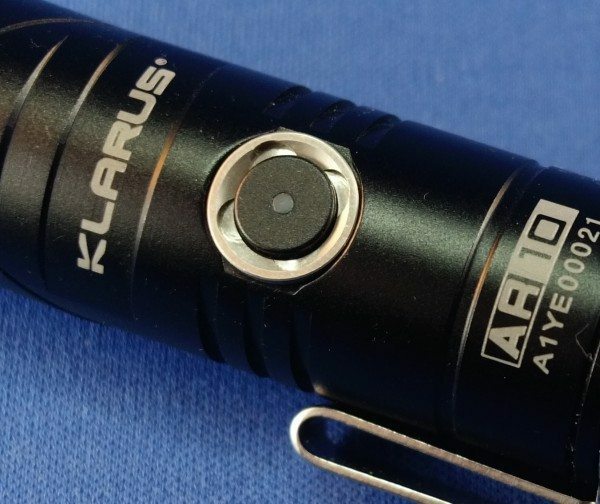 Klarus usually makes pretty good flashlights and they are one of the decently reputable companies unlike what the previous comment said. I have not had the opportunity to play with this light but I would want to mess with it before purchasing. I like 90 degree lights but the transition seems like a possible point of failure.